Gown styles vary depending on the type of degree. Bachelor-level gowns feature black, full-cut, long sleeves cuffed with a blue band on which “UHCL” is emblazoned in green. Master-level gowns feature black, long sleeves with an arc-shaped panel on each sleeve. The panel is finished with a blue band on which “UHCL” is emblazoned in green. Doctorate-level gowns are black, with black velvet down the front along with a golden seal school crest. The sleeves consist of three velvet stripes outlined in gold. Candidates for degrees at University of Houston-Clear Lake wear the black mortarboard with a blue-and-green tassel. Cap and Gown must be ordered online through the UHCL Bookstore as soon as you have applied for graduation. 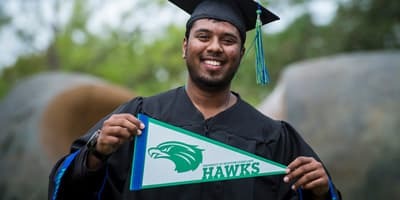 If you miss the deadline for ordering your cap and gown, the UHCL Bookstore will have limited supply and sizes of caps and gowns available for purchase. Your preordered Cap and Gown will be ready for pick up at the UHCL Bookstore the week of final exams. Please call the UHCL Bookstore to confirm business hours and if you have any further questions about caps and gowns at (281)283-2180. 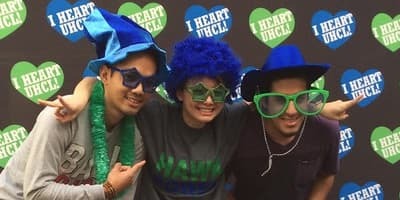 UHCL Bookstore will offer replacement caps, gowns, tassels and hoods for purchase on the day of the ceremony. You can only wear the usual academic regalia on the cap and gown. Honor cords are an acceptable addition, but other items like ribbons and shawls are not. Women wear their academic caps throughout the ceremony. Men remove their caps for the Invocation and Benediction. Master’s degree students wear a master’s hood during the ceremony. Master’s candidates wear their tassels on the left side of the cap. Bachelor’s candidates start out with the tassel on the right side of their caps and move them to the left side after degrees are conferred by the President. 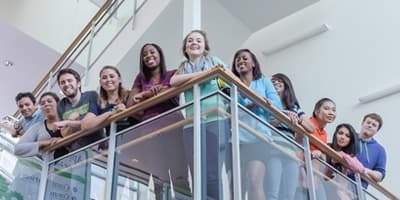 Our partners at Herff Jones have put together helpful videos to guide you through the ins and outs of cap and gown outfitting.